Royal Blood is a British rock duo band originally formed in Brighton in 2012. The band's sound is reminiscent of and rooted in modern garage rock and blues rock. The band, composed of bassist/singer Mike Kerr (formerly of Hunting the Minotaur) and drummer Ben Thatcher, was formed in Worthing in 2013, and played their first gig a mere two days after Kerr's return to England from his "working holiday" in Australia. During the summer of 2013, Arctic Monkeys drummer Matt Helders was seen wearing a shirt supporting the band (before the release of their first single) during their Glastonbury Festival concert in July. On 11 November 2013, the duo released their debut single, "Out of the Black", which came with a B-side called "Come On Over". In November 2013 it was announced that Royal Blood would be supporting Arctic Monkeys for two Finsbury Park shows in May 2014. In December 2013 Royal Blood were nominated for the BBC Sound of 2014. Royal Blood released their second single, "Little Monster", on 11 February 2014. The band also released a four-track EP, featuring "Out of the Black", "Little Monster", "Come On Over" and "Hole" on 11 March 2014 in North America. 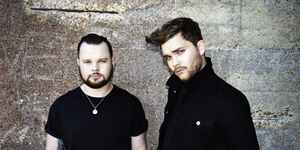 Their debut album, Royal Blood, was released on 25 August 2014. Royal Blood performed at South by Southwest in Austin, Texas in March 2014; at Liverpool Sound City festival and at BBC Radio 1's Big Weekend in Glasgow in May; and at Download Festival and Glastonbury Festival in June. They will perform at T in the Park festival in July, and at Reading festival in August 2014. Mike Kerr has previously used the name Royal Blood when living in Australia in 2012, working with drummer Matt Swan.